The peaceful town of Pokhara has become a warzone. Bright red smears highlight the pavements and walls, war crys echo down the streets. Victims are everywhere stumbling into restaurants looking for escape but there is none. Dazed and confused another projectile flies through the window and strikes an innocent in the face. The explosion splatters everyone close and red, gushing from his face, runs down his shirt. 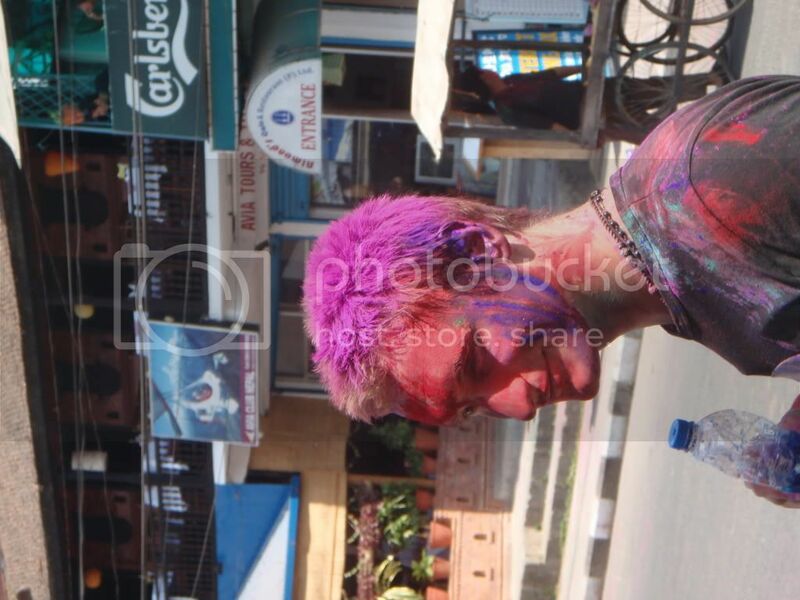 He stumbles backwards previously untouched by the madness he is now just another victim of Holi. It started at about midday, nothing too bad. A few skirmishes here and there but generally nothing major. I'd been on the streets already and had to be careful, dodging out of the way when a mob came through. Most westerners were being left alone at this point. Ever the journalist I had gone back to my hotel to get my camera. I returned to the madness and on leaving the hotel was confronted by a mob. They charged screaming their war cry. 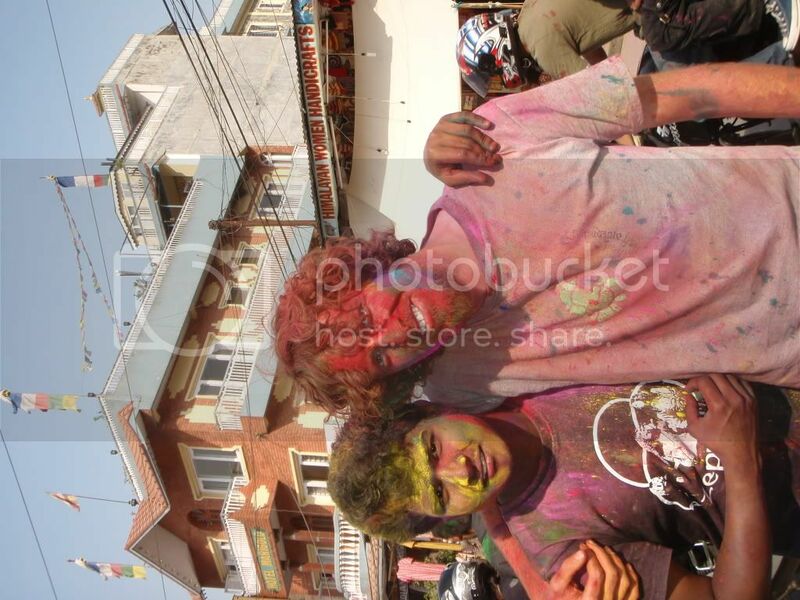 “Happy Holi, Happy Holi” their war paints of reds and greens glisten in the sun and I am soon part of the madness. As I duck to protect myself I feel hands pawing at my face. The whirlwind passes and I am left slightly dazed but grinning from ear to ear. 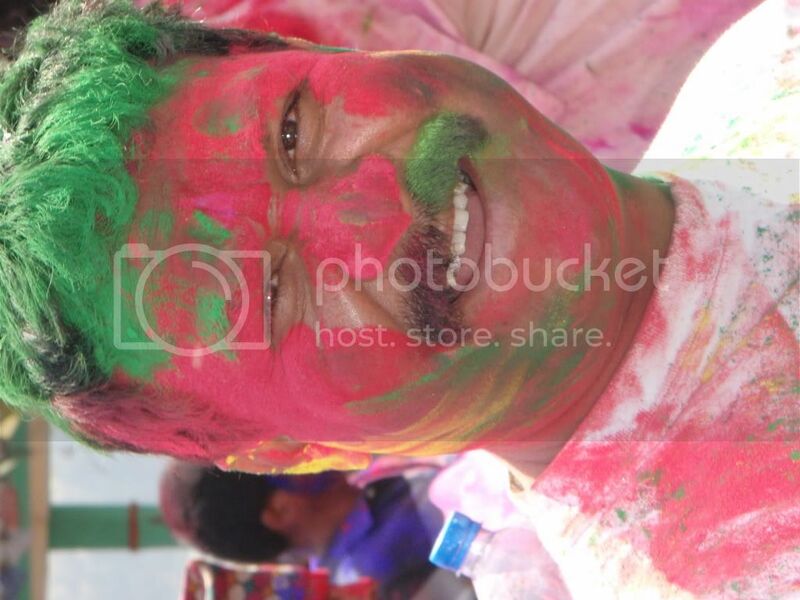 It is Holi, the welcoming of Spring for Hindi's and a festival of colour. As I walk down the street I see other westerners walking along in the same state as me. As we get close we laugh at each other. Reds, blues, pinks, greens. All the brightest colours of the rainbow cover our faces. The spirit of the festival has overtaken us. You can't help but enjoy it and I soon have a 1 litre bottle filled with purple water and adding my own splash of colour. A child of 10 makes a sneak attack from behind, green water splashes over my shoulder and I turn and chase. With revenge sorted and balance restored to the world I carry on my way down lakeside. The street is pockmarked with colour and I soon find myself within another group. They are singing and dancing and each comes upto me to add to the mess on my face and I add to theirs. A bit of red powder this time, smearing it down their chin or on their forehead. It's still pretty calm and all really friendly. The young kids are out and having water fights. It's the best time of their lives. Some hide on the rooftops letting down streams of water bombs and others in the street attack with water pistols made from whatever they can find. We eventually stop at a bar. It is packed out with tourists seaking shelter but we stay on the street. Too covered now to make a difference we greet everyone who passes and exchange colour. We are changing colours like chameleons blending into one another. With each wave of people that passes we are unrecognisable and taking photos of each other to show us what we look like. Laughing and smiling in some kind of colour induced ecstasy conversation flows easily and a bar of complete strangers are now close friends. Ok before I write about the rest of the day there is something that amazed me about this day. I said earlier that I walked down the street and was left alone. What amazes me is not only the way people throw themselves into this festival but the way they restrain themselves as well. Even the photos don't really show it and I have put a video on facebook but there are probably millions of videos now. It is total ecstasy in these crowds. They are dancing and singing. Jumping around like lunatics. The looks on the faces of people are that of men gripped in drug induced happiness smiling and laughing so much it has to be unhealthy. They literally charge at people and cover them in colour from head to toe. As one of these groups approach several things happen to you. Firstly there is a bit of fear. Then they reach you it is madness with hands all over you and strangers within milimeters of your face. The madness is catching and I caught it very quickly. They soon pass and the result is devestating. The madness left my body and it left a gap when it went. I felt both extremely happy and empty at the same time. It was like withdrawal symptoms, fortunatly my next hit was always just around the corner. But back to what amazed me, within this crazy indescribable mass of people there was complete control. If I didn't have colour on me I would not be approached. There were thousands of people dripping in colour and then a few people who were completely untouched by any of it. Some people with cameras were getting right inside the mob to get photos and they would walk out clean like they had a protective bubble around them. All I can say is that they had the mob mentality. They opened their hearts up to being part of a single mind but they retained enough control in all of it to keep their own mind too. I have no doubt that if one person in the mob put colour on someone who didn't want it then everyone else would do the same but no-one did. Unfortunately, as the sun was setting, I saw some drunk bikers riding around specifically looking for people who were clean and then targeting them. Another reminder that no-where is perfect. So for me and the rest of the day. Well the group that had formed at the bar moved around a little and got a bit bigger, eventually there were 11 of us so we decided to go for a group wash in Fewa lake. Hired a boat, paddled out into the middle stripped off and dived in. Someone even bought shampoo so we could get the worst of it off. It was good to get into the cool water after running around for half the day and after a bit of splashing around and the odd backflip we cracked open the beers and watched the sun set behind the mountains. After letting the girls try to peddle the boat back in and basically spinning it in circles I took over for the ride back. It was slow going and we had drifted away from the dock but we got there eventually and with only one broken bottle. We docked and after a small incident involving a dog and a drunk Jordie we were back on dry land. We split up and agreed to meet up at the Busy Bee later. The rest, as they say, is history. A night of too much alcohol which is a story played out all over the world a million times a night and, I suspect, you don't need to read about it. Well Ollie, getting in a mess was never a problem for you. It sounds as though you were in your element. 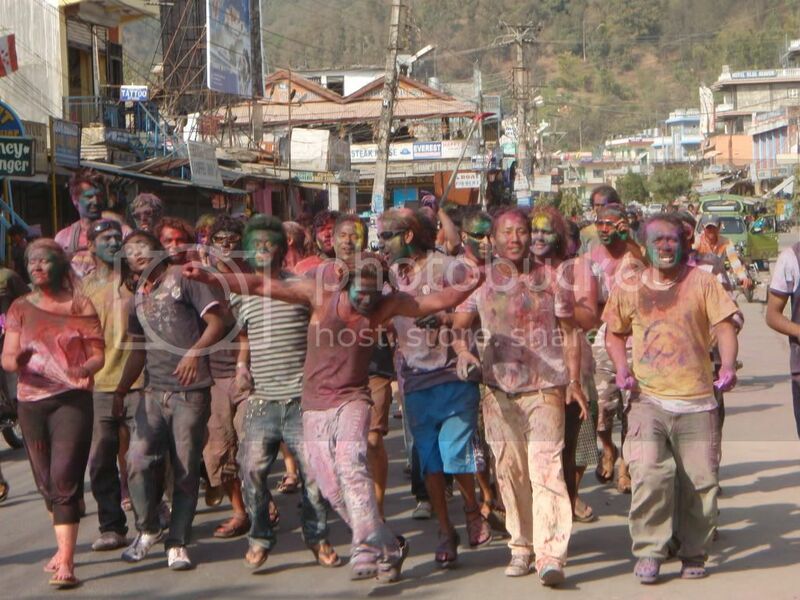 The incident of the green painted dog in the night must have been good practice for "Holi" eh? Ollie, that was really good, not only is your musical prowess growing but your writing exceeds even that! Really great my friend, enjoy the next adventure! You certainly know how to capture your readers. My heart was in my mouth at the beginning of your story. That sounded so much fun-so great to be young and uninhibited! !